Yamaha has unveiled a brand new synthesizer workstation, the MODX. This synthesizer workstation replaces the MOFX in their product range. The MODX is a new mid-priced synth with the Montage’s sound engine: AWM2 (Advanced Wave Memory 2) sampling and synthesis engine and eight-operator FM-X engine. The AWM2 section can have up to eight elements, made up of either sample waveforms or oscillators, and is 128-voice polyphonic. The FM-X engine offers eight-operator FM synthesis with 88 algorithms and 64-voice polyphony. Via Yamaha’s online converter app, the MODX can load patches from the company’s classic FM synths, such as the DX7. The MODX features Yamaha’s Motion Control system and Super Knob controller. This is effectively a multi-use macro controller that can handle complex automation and morphing between layers. For more detailed parameter editing and control, the MODX includes a 7-inch central touchscreen. There is also a complex arpeggio system and multiple performance ‘scenes’ to aid live playing. In addition, the MODX also features a professional 4-in/10-out, multi-channel USB audio interface. Along with its built-in sample library, the MODX contains 1GB flash memory for user sample upload. It is expandable, with more sound content available from Yamaha. 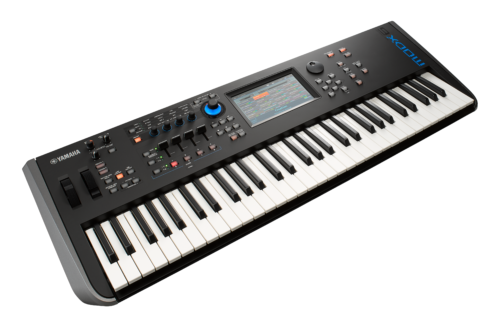 The MODX is lightweight and is available now in MODX6 61-key, MODX7 76-key semi-weighted and the 88-key Weighted Action Synthesizer MODX8 comes in at a svelte 30.4 lb.